Xtreme Piranha Darts- Steel-Tip Darts from Dart World. Dart World Innovation! Created with the help of Dart World Sponsored players using high quality 90% Tungsten and the best selling shaft, the Top Spin. Special Coatings of Titanium and Silicon Nitrates give a distinctive look and feel to these top-of-the-line darts. The Platinum darts comes in Dart Worlds Popular Galaxy Case. All Newer Dart World Premium darts are being made with the New 1-1/2" Piranha Point Installed. These points extend 1-1/4" from the barrel. 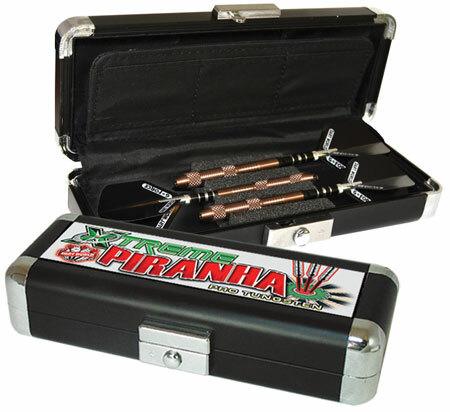 Plus- we may still have Xtremes which have the 1-3/4" Piranha Points on them- which extend 1-1/2" from the Barrel. Each Dart will have the Point and/or options available listed.